Last Saturday, 18 July 2009, photographers all over the world gathered at different times, in different cities to join in the phenomenon that is photo walking. South Africa was no exception, with ten walks throughout the country. I took part in the Stellenbosch walk as did Irmel and her daughter. There were some other familiar faces from the club but I’m bad at matching names to faces so you’ll have to excuse me for not naming them. We met up at 7:30 at Jan Cats restaurant and the walk got underway at 8am, when we all split up and ambled off for two hours of photography up and down Dorp Street. We met up again at 10am and many hung around to chat and drink coffee. Sadly I had things to do so had to leave right away. Further to our article elsewhere on this blog, advertising the Scott Kelby Photo Walk in Cape Town, it is pleasing to be able to inform you that Sanet of Stellenbosch has organised a walk starting in Dorp Street, Stellenbosch. 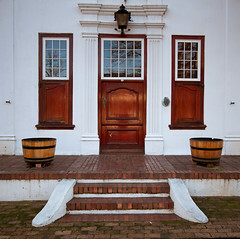 The even takes place on Saturday 18th July, and if you are interested, please go to the following websites: http://worldwidephotowalk.com and http://worldwidephotowalk.com/stellenbosch-wc-za. Please register as soon as possible. It is great fun and takes only a few hours of the morning. All images get sent to Scott Kelby, who selects the best to be shown on his website. Scott Kelby’s 2nd Annual Worldwide PhotoWalk™ is taking place on Saturday 18 July 2009. If you’re interested in taking part, get over to the page for the Cape Town walk and sign up. Only 50 participants are allowed for each walk.